SSL/TLS certificates protect sensitive data by encrypting connections between the client and the server. Moreover, having a valid SSL/TLS certificate is practically a requirement on today's Internet. To improve security and give your customers peace of mind, we strongly recommend protecting Plesk and the Plesk mail server with SSL/TLS certificates. This topic explains how to secure both Plesk and the Plesk mail server with a free SSL/TLS certificate from Let's Encrypt, an SSL/TLS certificate purchased from a certificate authority, or a self-signed SSL/TLS certificate. 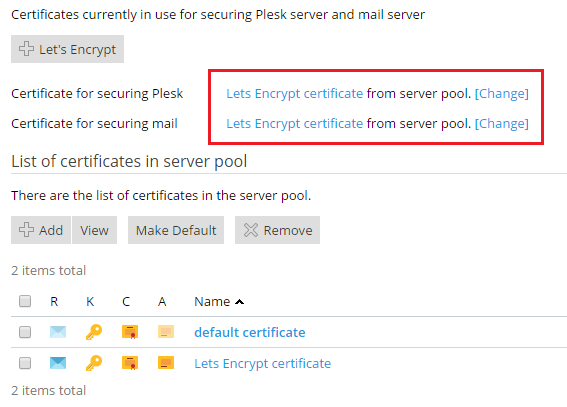 During installation, both Plesk and the Plesk mail server are automatically secured with a free self-signed SSL/TLS certificate. This allows for encrypting connections to Plesk and the Plesk mail server so that, for example, passwords could not be intercepted in transit. However, self-signed SSL/TLS certificates come with a drawback. Anyone visiting a Plesk server secured with a self-signed SSL/TLS certificate is shown a warning telling them that the website is not trusted, which may cause concern. To avoid this, we recommend securing Plesk and the Plesk mail server with either a free SSL/TLS certificate from Let's Encrypt or an SSL/TLS certificate purchased from a certificate authority. Go to Tools & Settings > SSL/TLS Certificates (under "Security"). Click the + Let's Encrypt button. Go to Tools & Settings > SSL/TLS Certificates (under "Security") and click the + Add button. Copy the whole content of the “CSR” section (including -----BEGIN CERTIFICATE REQUEST----- and -----END CERTIFICATE REQUEST-----) to clipboard. As we explained earlier, self-signed SSL/TLS certificates are never trusted. It is always preferable to use an SSL/TLS certificate from Let's Encrypt or a paid SSL/TLS certificate from a different certificate authority. However, you can secure Plesk and the mail server with a self-signed SSL/TLS certificate, if desired.